My opinion, from working with Carmen at PS6 in Manhattan as a parent while she was principal, is: if you curry her favor, say what she wants to hear and hurt people she doesn't like or believes are challenging her in any way, you can do anything you want. Just hide the bad stuff and threaten horrible consequences for squealing. The latest event in the list for her legacy is John Dewey High School. Before Bill De Blasio appointed Carmen, many, many people urged him NOT to pick Carmen as Chancellor. Obviously, our opinion doesn't matter. 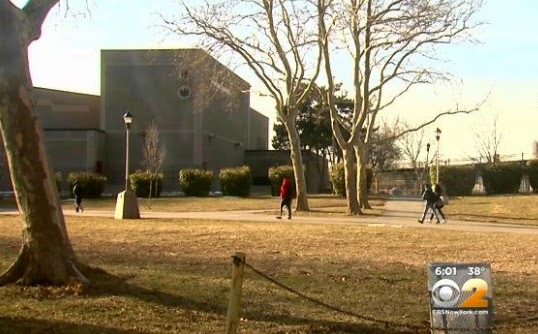 NEW YORK (CBSNewYork) — Teachers have blown the whistle on a massive grade-fixing scandal at a Brooklyn high school. Hundreds of students who didn’t make the grade were allegedly given passing grades, and teachers told CBS2’s Marcia Kramer on Monday that administrators knew all about it. “There’s like a senior house, where people get creditsjust for basically being in study hall. I know about that. Homework, eat food and they get credits for that,” John Dewey High School senior Jacob Pena said. Charges include the principal and her administrators pressuring teachers to do all manner of things to pass failing students. The kids call it “easy pass.” It’s done to increase graduation rates, Kramer reported. Former teacher Martin Haber told Kramer he retired last June because of it. “They devised all kinds of crazy and innovative ways to pass them. If a student played a game in the computer room on the computer, that was a credit,” Haber said. Both the city and Schools Chancellor Carmen Farina knew all about it, teachers told Kramer. Kramer was told that city investigators came to the school on Dec. 3 and that 10 different teachers spoke to them. They gave them names of students whose grades were changed and other details of the so-called “credit recovery program,” but still nothing has been done. Kramer spoke to one of the teachers who talked to the investigators, a person so afraid of being fired by Principal Kathleen Elvin, who educators said is the “easy pass” architect, CBS2 had to hide the teacher’s identity. “Basically, just changing grades en masse. The principal is a scoundrel. She’s a fraud. She has allowed this to happen. She has encouraged it. She has set it down that if you don’t follow her rules she will crush you. She’s a horror,” the teacher said. Kramer asked what the teacher and others told investigators. Schools Chancellor Farina was asked about the probe on Monday. “We’re investigating that,” Farina said. The chancellor, who was at a Queens high school on Monday, ducked out a back door to avoid answering further questions, Kramer reported.